Unfortunately, it’s the last day of school, and as Gerry imagines next year, it’s hard for her to find her sparkle. “Miss Pym says my ‘exuberance’ will set the tone wherever I go,” she writes. But it’s a genuine worry, and it gives the book a legitimate problem to solve — even while telling it all from the perspective of the little girl. Her family tries to cheer her up, but she still worries. Change is hard, she’ll miss her friends, and next year, her teacher is going to be…a man! 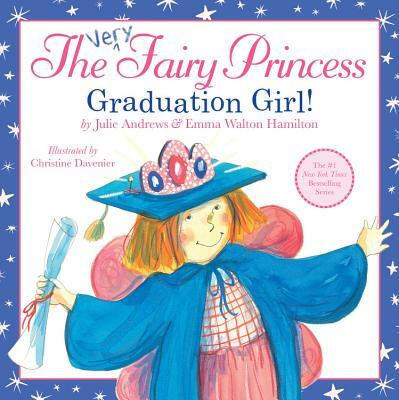 This book would make a wonderful gift for a girl’s graduation from kindergarten. It’s written with real affection for its character, echoing emotions that parents may want to share with to their own daughters. The narration is fond and playful, and while it stays in the voice of its own confident little narrator, it actually provides a loving reason for all the things that a mother might cherish about her own little girl. Why is she so creative and enthusiastic? Because she’s a fairy princess! When the book finally arrives at graduation day, there’s a moment of bittersweet tension. “Keep that sparkle bright,” says Ms. Pym. But there’s a happy ending, and lots of fun enthusiasm throughout the book, which felt like a big slice of birthday cake. And it manages to sneak in every mother’s secret wish for her own daughter — to share your sparkle with the world. Julie Andrews actually wrote this book with her daughter, Emma Walton Hamilton. (Maybe that’s how so much real affection seems to find it’s way into the story…) Daughter Emma also wrote Raising Bookworms: Getting Kids Reading for Pleasure and Empowerment, so I like to believe that she’s learned something about truly honoring a child’s point of view. As the Very Fairy Princess tells her story, she’ll gradually learn that change can mean fun and delightful surprises.